We are regularly asked our advice on how to style a beautiful rustic wedding and we start by establishing the time of year that the couple are planning to get married and quite how ‘rustic’ they are prepared to go! This year we’ve witnessed a real move towards a more ‘Rustic Glam’ feel with the introduction of more sparkle, mercury glass and sequins to the look. Spring bulbs in galvanised pots make lovely homespun centrepieces – a job for the green-fingered amongst your bridal party! 1. Daffodil yellow can be teamed with neutrals such as navy, grey or stone to create a colour palette with a nod to spring. Add in rustic textures such as hessian and bark to complete the look. 2. Use pairs of distressed stone urns planted with hellebores to dress your alter, or stand on pedestals at either end of the top table. 3. Create simple, tall centrepieces using small blossom branches in enamel jugs. 4. Blue and white vintage crockery works brilliantly with spring bulbs and can evoke a country farmhouse feel. 5. Choose cottage garden flowers such as delphiniums, phlox and daisies to create the feel of the countryside. Finish bouquets and containers in hessian and twine. 6. 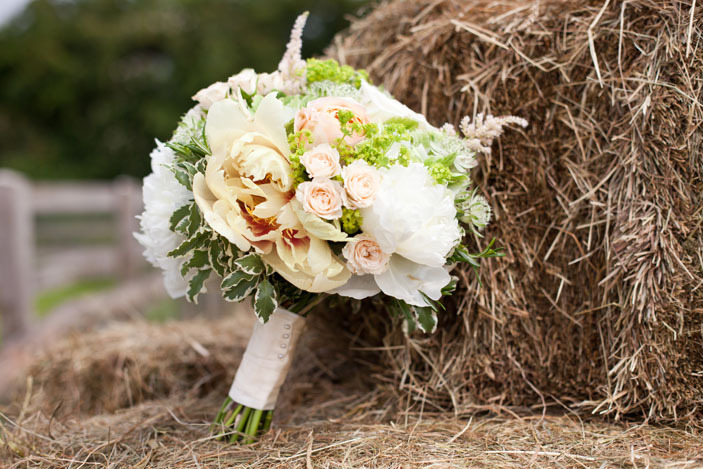 Use hay bales as seating outside your reception venue, top them off with mis-matched vintage blankets and eiderdowns. 7. Ask the creative members of your wedding party to create outdoor signage on old doors, crates and pallets, for a rough and ready personal detailing. 8. Lavender plants in aged terracotta pots make inexpensive centrepieces. 9. Use a rusty old wheelbarrow, filled with ice, to present and serve bottled drinks. 10. Pumpkins and gourds can be hollowed out for floral or candlelit centrepieces. 11. Attach place names to apples and place at every place setting to give a pop of colour and a bonus pre-starter snack! 12. Wrap simple glass containers in pliable bark and tie with jute and twine to create vessels with a rustic feel. 13. Consider oak leaves in your bouquets to provide texture and a real seasonal detail. 14. Use log slices to display your centrepieces or decorate a dessert table to add height variations. 15. No rustic winter wedding would be complete without copious amounts of twinkly lights wrapped around uprights and hanging from the ceiling. 16. Raise hurricane lamps on sections of small tree trunks to give them height and finish with holly and berries around the base. 17. Lots of pillar candles en masse can be very atmospheric in the right rural setting. 18. Place simple bare twigs and branches in tall, slim containers and finish with a dusting of artificial snow. 19. Team antique, ‘mercury’ glass in shades of silver, champagne and gold with more natural elements such as hessian and vintage cotton doilies to add a touch of glamour to your rustic look. 20.